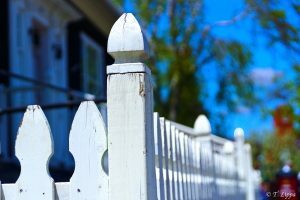 White Picket Fences – A Book Review and Giveaway! 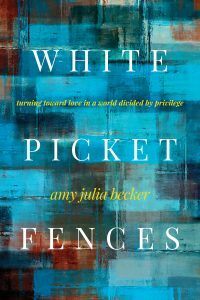 I picked up Amy Julia Becker’s book White Picket Fences: turning toward love in a world divided by privilege to supplement the journey I’ve been taking to better understand white privilege and the role I play in it. You can read my freshman attempts at analysis here and here. Ms. Becker is also walking this path and asking similar questions. Ms. Becker doesn’t claim to have all the answers. In fact, she confesses to a fear of not knowing how to truly feel compassion, saying, “Im afraid that I will always be set apart from people who do not share my advantages. I am afraid that I am helpless to do anything about very real inequity.” In response she researched the racial violence that appears all over the news of late and found that “police interaction with black men has not increased in recent years. People like me – people who live in predominantly white America – have simply become more aware of it.” And people like me. In the life of her daughter with Down Syndrome, Amy Julia sees a glimmer of understanding for those who’s identity falls outside the norm. She writes of realizing that had she lived in Nazi Germany, her daughter would have been taken away and killed, just as the Jewish people who were singled out – her wealth or white skin powerless to stop it. I remember having the same type of revelation about my daughter Shelby when on Ellis Island for the first time. If my family had come through as imigrants in the early years of our country, my husband and I would have been offered two choices. 1. Leave Shelby in a “hospital” there and start our new life without her or 2. Turn around and make the long and dangerous voyage back to whatever bad situation we came from – whether or not (probably not) we had the money for fare. This book declares that, “We deface the image of God every time we disdain or abuse another human being.” It’s message? Every human is valued by nature of being known and loved by almighty God. “It will take thousands upon thousands…to bow our knees and take up a posture of humility, of listening to others instead of insisting on hearing our own voices, of admitting our own complicity in harm, of opening our hands and hearts to healing even when it hurts.” This book is not a solution to inequity. It’s just a beginning. And I definitely recommend beginning by reading it. Tyndale House Publishers kindly provided me with a complimentary copy of this book. 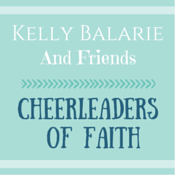 I am giving away my copy to one reader of this post! All you have to do is subscribe over on the right side of this page to receive my posts every week (and I promise I almost never send you more than one message a week). If you are already subscribed – thank you so much! – you can still be entered by leaving a comment! One commenter/ subscriber will be selected at random and notified via email next Friday November 16. You can also purchase your own copy of the book here from Amazon or anywhere good books are sold. If you choose to purchase this or anything else through my link, I will receive a small commission to help offset the costs of my website at no extra cost to you. Thank you in advance! Hi there – this book sounds interesting. 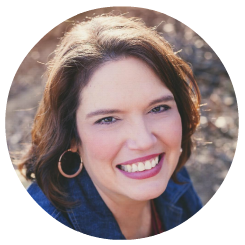 I’m a writer who loves writing about the margins of life from my experience of chronic illness. Coming to you from Five Minute Friday! I would recommend it, Tanya. Very thought. Provoking. Any book that says “We deface the image of God every time we disdain or abuse another human being.” has immediately moved to the top of my TBR pile. Thank you, Lauren. It sounds wonderful, I would love to see more stories along the lines of American Girls or other classics, there are some obscure stories I hear about heroines. I’m sure they are there to be researched. Girls need positive role models in books and movies. When I was growing up I just took it for granted that I could easily find a book, classic or current, with a heroine who looked like me. From Little Women to Ramona and Beezus to Wrinkle in Time there was always someone I could relate to. I think we under estimate how profound an impact than can have on our view of what life and humanity “should” look like. I think there is a lot of truth in that, Stacey. Looks like an interesting book, Lauren. In my life as an Asian mercenary trying to protect people of various colours from being killed or worse by people of similar or different colours, I learned one very basic truth. We all bleed red, and we all call for the God in which we believe, or for whom we hope, when torn by bullet or blast. That’s a truth and perspective not many will ever have Andrew. Thanks for sharing. i remember reading a lot of biographies when i was growing up. i guess they helped balance out that desire for more variety in my characters. i remember reading about george washington carver (someone i rarely hear about in the conversation of black characters from history…not sure why. he was an amazing man! of course, there were many others, the first woman medical doctor, and many others as well. reading about the hardships they faced as they plodded on and didn’t whine. very encouraging and hopeful! i’m interested to hear about your daughter. how difficult. i too, am epileptic. started when i was 20 in nurses’ training. but i have been fortunate to have my seizures well controlled except for a year period during menopause that was very wild and woolly 🙁 much different from her situation. i’m at #2 slot this week. Hi Martha. I LOVE biographies and how they give us a glimpse of people different from us. I have often wished I could understand what my daughter has to deal with. I know it sounds crazy but I used to wish I could experience just one seizure so I would know. I can’t imagine how scary that wild year was for you. Thank you for reading and sharing. I don’t think you will be sorry, Joy. Such a profound post, Lauren. Thank you for being bold enough to write about such a topic. We chose to homeschool our daughters to provide them with the knowledge of historical men and women, who in spite of their circumstances went on to accomplished great things. Women, who looked liked them, who refused to just be another statistic. I would have enjoyed your history lessons, Brenda! Thanks for sharing about this book, Lauren. It looks like one I would love to read! So I just got the Kindle sample sent to my Kindle. We all need to step out of comfort zones again and again to see the world through each other’s eyes. I agree, Lisa. Thanks for stopping by. I love this and feel it’s so important. We can’t just whitewash history. We need to learn about it and not forget the mistakes of the past so we don’t make them again. Your neighbor at Destination Inspiration. This sounds like a very thought-provoking book. Eye-opening to things we often may overlook or not give a second thought to because of our own comfort level. Thanks for sharing!! Thought-stirring, Lauren … bless you. “We deface the image of God every time we disdain or abuse another human being.” YES, yes, yes!! All the yeses to this! Oh, that we would get this through our thick skulls! It’s worth it Rachel! Thanks. Thank you for this book review. Understanding white privilege is a journey and how this affects those around me is one of continual discovery. I appreciate your vulnerability and openness in this review. Thanks for sharing at Booknificent Thursday on Mommynificent.com!